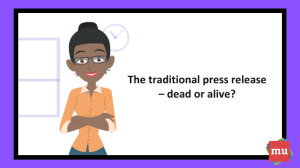 Video: The traditional press release – dead or alive? Your browser does not support the canvas. The digital age has brought forth major changes in industries over the last few years – with public relations being no exception. With no sign of these changes slowing down, it’s enough to make one wonder: is the traditional press release doing enough to keep up? “I think the press release format is dead,” says TechCrunch editor, Mike Butcher. Is he right? Over recent years, the daily life of a PR pro has changed considerably. This is thanks to advancements in social media and digital advertising, as well as the ever-increasing need for personal relationships between brands and consumers. However, one thing that hasn’t changed is the press release. So what does this mean for the PR industry? Well, the time for press releases isn’t exactly over, it just needs to evolve. Want to stay up to date with the latest news? Subscribe to our newsletter. It takes more than big news or exciting predictions for your press release to catch the eyes of journalists. And with all the competition out there, making sure your press release stands out is imperative. That’s why we’ve put together this simple guide to get you started: Your essential guide to sending press releases at the right time. Rate this article as Short, Tall or Grande. Rate it as Short, Tall or Grande. © 2019. All rights reserved by media update. Send Us Your Story - It's Free! Do you have great media, marketing, PR or social media content that you would like to share with us? You can submit content to us via email for consideration for publication. We can’t wait to hear from you. media update complies fully with the POPI act. We have taken necessary steps to secure our computing environment and to keep your data safe. As per our T&Cs we undertake to never sell or share any of your personal information to any 3rd party unless obliged to do so by law. Your information will solely be used for the personalisation of user experience as well as the storage of user settings and preferences. Bookmark and comment on articles. No Connectvity. What does this mean?